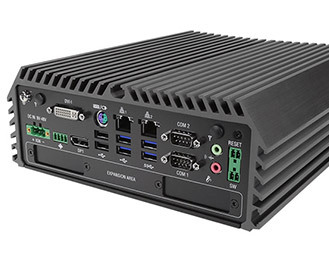 Rugged, industrial design with expansive I/O and 6th generation Intel Skylake processor. The exceptionally capable DS-1100 is a compact powerhouse fully utilizing Intel’s powerful Skylake desktop processors, offering up to Core i7 paired with up to 32 GB of memory for high-end rugged computing. The Q170 chipset provides support for advanced technology such as vPro and virtualization while optional 4G LTE connectivity enables remote network access for in-vehicle installations or failover protection. Designed to operate in industrial settings where commercial computers would be pushed past their limits, the DS-1100 performs in any environment that requires high-end computing. Encased in a rugged, fanless, ventless, and cableless enclosure, the DS-1100 can withstand anything from dirt, dust, shock and vibration with ease. A temperature range of -40°C to 70°C and an input voltage of 9~48 V give the DS-1100 long-lasting reliability even in the most extreme environments. 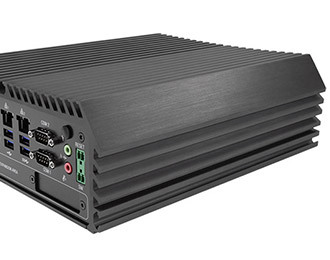 The DS-1100 comes equipped with two Gbe LAN ports and two RS-232/422/485 COM ports for connectivity to a wide range of peripherals and equipment while a 2.5” hot-swap HDD bay provides additional easy to access storage. 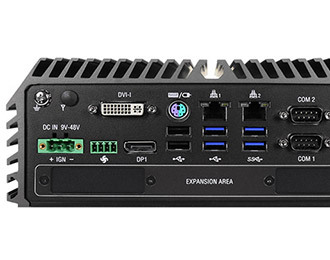 Just one of many areas where the DS-1100 shines, the system has a plethora of connectivity options with 8 USB ports (Including 6 USB 3.0 ports), in conjunction with two DisplayPort connectors and DVI-I allowing for triple HD displays. The DS-1100 offers an incredible array of expansion possibilities including additional COM, DIO, LAN, PoE, and USB. 8.94" x 3.46" x 10.28"